With Volkswagen’s all turbocharger driven engine lineup gracing the new MK7 platform, APR was presented with the unique opportunity to bring visual excitement and technical awareness to the driving and tuning experience. 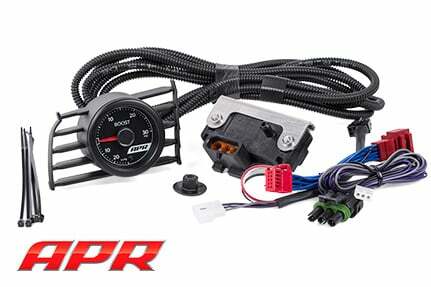 After conducting extensive design studies and testing multiple revisions, APR has developed an elegant plug-and-play vent-mounted boost gauge system worthy of gracing the interior of Volkswagen’s latest models. The APR Boost Gauge System features a high quality and accurate electronic 52mm gauge with smooth and precise movement thanks to a microprocessor driven stepper motor. The gauge’s anti-fogging polycarbonate lens allows reliable vent-mounted operation without fogging as is common on units without this design specification. 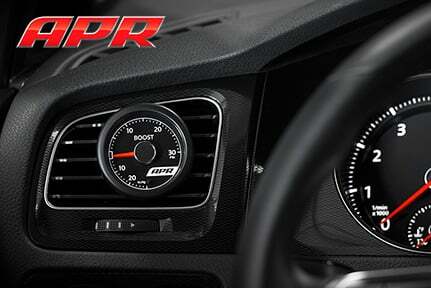 Visual design cues were borrowed from the MK7 Golf, GTI and Golf R instrument clusters to deliver a dimmable LED backlit face with multiple needle colors that look right at home within the vehicle’s interior. The gauge seats neatly inside a high-quality injection-molded vent mounted pod, resembling the OEM design, allows airflow to continue past the unit and still allows operation of the vent airflow control.